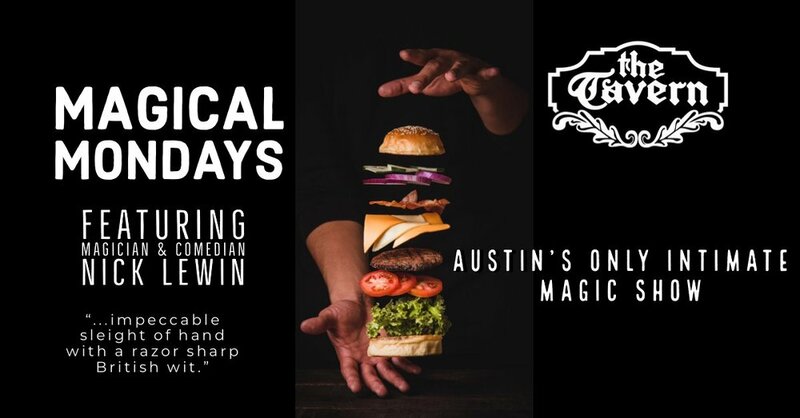 Join us for the first of many Magical Mondays upstairs at The Tavern; Austin's only intimate magic show! Every third monday of the month the historic Tavern will present cocktails, comedy, and world-renowned magic conjured together for an unforgettable evening of thrills. February 25th will kick off the series with award-winning magician Nick Lewin! Starting the evening with a mixer featuring specialty cocktails and catered appetizers highlighted by close-up magic by the mystifying Gary Plants and a touch of music from Little Jewford. Followed by headliner Nick Lewin sharing his highly individual mix of stand-up comedy, sleight of hand, and mind magic. Nick's dry humor brings a special magic to his performance and is sure to be a recipe for pure entertainment. This intimate experience is not to be missed! Tickets include two world-class magical acts and catered appetizers. Seats are limited and tickets must be purchased in advance, reserve yours now!